This is the traditional dessret served st Danish Christmas Eve. 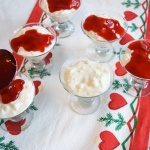 It's subtle almond flavor is a delight and topped with fruit sauce it will add a simple elegance to your holiday table. Bring milk to a boil, stirring constantly. Add rice and bring to a boil again; reduce heat to simmer and cover pot with lid. Every 10 minutes stir rice until it has reached desired doneness. Do this for 30-50 minutes. Make sure to cover pot with lid when done stirring. Rice should be soft. Add salt to taste. Pour into a bowl and immediately cover with plastic wrap. Don't just cover the bowl with the wrap, actually place the wrap directly onto the rice. This will eliminate any layer of skin forming over the top of the rice mixture. Let cool and then refrigerate. Keep in refrigerator for several hours until completely chilled. You can leave in the fridge overnight if desired. After the rice has been chilled add in the sugar, vanilla and almond extract. Fold on the whipped cream. (Make sure you have whipped the cream prior to adding it to the rice mixture. Fold in about half and then determine if you like the consistency, add more as needed). Fold in the almonds. Refrigerate until ready to serve. Make the Danish Dessert according to the directions on the back of the box. There are various sets of directions on the box. Be sure to follow the directions for the fruit sauce. Serve warm sauce over chilled rice pudding in small desert dishes or bowls. **Note: Make sure as you allow the rice to simmer that you check it every 10 minutes to see if it is soft enough. This process can take anywhere from 30 to 50 minutes, so don't give up! Start with half the amount of sugar and taste. Add more sugar if desired until you reach the amount of sweetness you want. Sugar can also cause the pudding to become runny so this is another reason I start with a lesser amount of sugar. Make sure to whip the cream prior to adding it to the rice mixture. If you don't whip the cream your pudding will be super runny - it will taste good but it will be more like soup than pudding!